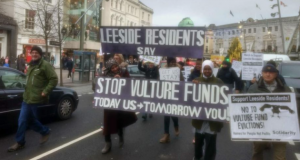 The protest was called by the Irish Congress of Trade Unions (ICTU) and the National Homeless and Housing coalition – a coalition of student unions, Housing campaigners, political parties including Solidarity, trade unions and others. 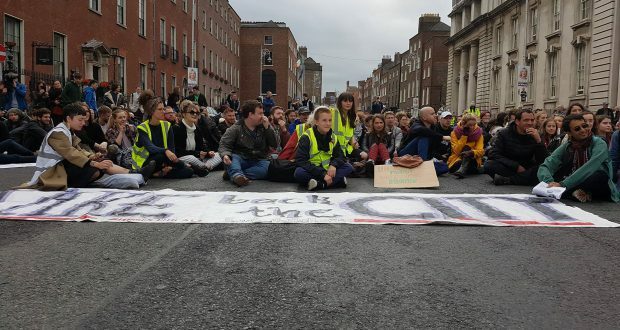 A very significant part of the protest was made up of young students, members of what in Ireland is now being called the “locked out generation”. 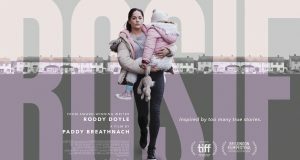 Inspired by the successful campaigns for marriage equality, repeal of the anti-abortion laws and abortion rights significant numbers from the locked out generation are now beginning to turn their attention towards activism on the housing issue. Many of these young people have also been inspired to take action by the audacious Take Back The City campaign which has organised several occupations of vacant properties owned by big landlords in Dublin City Centre. A violent raid in September on an occupied building by private security wearing balaclavas, backed up by Gardai wearing ski masks has only served to increase determination to make a stand despite arrests and people being hospitalized. Rising rents, record homelessness, half a million young people locked out of the housing market, all this has created a mood for change on the issue. Record profits for land hoarding developers and greedy landlords has only hardened that mood. Ireland’s largest corporate landlord IRES Reit recently announced that profits for the first six months had doubled over the previous period for last year. All of this is presided over by a Fine Gael led minority Government which refuses to learn the lessons of the 2008 property crash and remains utterly devoted to the “market” – and refuses to take any actions which significantly curtails its operation. Government worship of the market is only copperfastened by the fact that 36% of Fine Gael TDs are themselves landlords while 33% of Fianna Fáil TDs are landlords too. The Socialist Party and Solidarity demands 100,000 units of public housing be built over the next five years. Housing analyst Mel Reynolds estimates that there is enough State lands zoned for residential use in the hands of the local authorities and the National Assets Management Agency (NAMA) to build 114,000 public homes. This can be paid for without resorting to increasing tax on working people. Recently Apple were found by the European Commission to have benefitted to the tune of €13 billion plus interest from sweetheart deals with the Irish State and were forced to lodge €14.3 billion into an escrow bank account pending an appeal (by Apple AND the Irish State!). The State should drop this outrageous appeal and announce its intention to spend all monies on social investment. 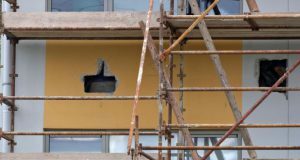 It is estimated by academics in Maynooth University that the State could save €23.8 billion over 30 years by building public housing rather than enriching landlords via HAP (Housing Assistance Payment). The surge in homelessness is coming first and foremost from the issuing of notices to quit by private landlords. It is literally insane to allow such evictions continue apace in the middle of the greatest housing crisis in the history of the State. The demand for an outright ban on economic evictions is a potentially powerful magnet for a developing mass campaign. The government’s “rent controls” have proven to be a cruel hoax. Rent real controls should mean not just a slowing of rent inflation or even a freeze on rent. When rent is as high as it currently is, real rent control must mean measures which slash the price of rent. The Socialist Party and Solidarity support a stepping up of action on housing.We will continue to support civil disobedience in the form of the Take Back the City campaign and will encourage similar resistance to evictions in communities. The unions must take off the gloves with the Government. The Government are not “social partners” and a Fianna Fáil Government would be no better. The unions and the housing movement should seize the initiative and now name the date for a major national Saturday demonstration in November. If this is done alongside sharpening the demands for public housing, a ban on economic evictions and real rent controls a major step forward in building a movement can be taken. The Socialist Party and Solidarity will strive to build such a movement while fighting to build a strong socialist Left to challenge the rule of the capitalist market at the root of this crisis.